34 • June 2018 www.concreteproducts.com Consumers' Concrete Products team musters at Icon Expo 2018 for a briefing on the Wyoming plant-bound machine; from left: Brian Biscoff, Brody Flint, Randy Parsons, Fred Jacobs, Melissa Kline, Stephen Hernandez Gonzales, Bruce Blair, Tim Knipp, Gary Allen, Brett Pierce, James Mansfield, Josh Wooden, Paul Gayle, Mark Lewis and Morrey Haggar. 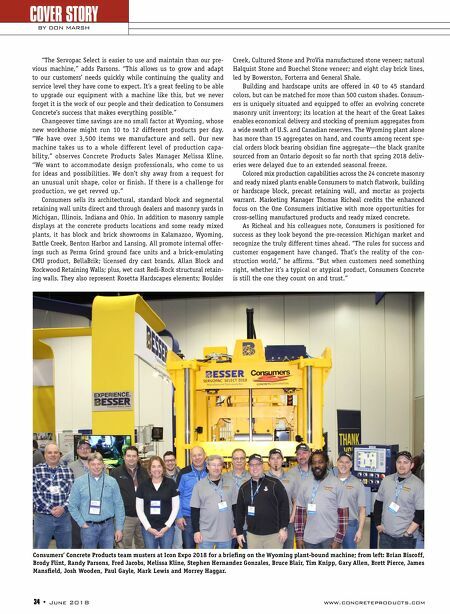 COVER STORY BY DON MARSH "The Servopac Select is easier to use and maintain than our pre- vious machine," adds Parsons. "This allows us to grow and adapt to our customers' needs quickly while continuing the quality and service level they have come to expect. It's a great feeling to be able to upgrade our equipment with a machine like this, but we never forget it is the work of our people and their dedication to Consumers Concrete's success that makes everything possible." Changeover time savings are no small factor at Wyoming, whose new workhorse might run 10 to 12 different products per day. "We have over 3,500 items we manufacture and sell. Our new machine takes us to a whole different level of production capa- bility," observes Concrete Products Sales Manager Melissa Kline. "We want to accommodate design professionals, who come to us for ideas and possibilities. We don't shy away from a request for an unusual unit shape, color or finish. If there is a challenge for production, we get revved up." Consumers sells its architectural, standard block and segmental retaining wall units direct and through dealers and masonry yards in Michigan, Illinois, Indiana and Ohio. In addition to masonry sample displays at the concrete products locations and some ready mixed plants, it has block and brick showrooms in Kalamazoo, Wyoming, Battle Creek, Benton Harbor and Lansing. All promote internal offer- ings such as Perma Grind ground face units and a brick-emulating CMU product, BellaBrik; licensed dry cast brands, Allan Block and Rockwood Retaining Walls; plus, wet cast Redi-Rock structural retain- ing walls. They also represent Rosetta Hardscapes elements; Boulder Creek, Cultured Stone and ProVia manufactured stone veneer; natural Halquist Stone and Buechel Stone veneer; and eight clay brick lines, led by Bowerston, Forterra and General Shale. Building and hardscape units are offered in 40 to 45 standard colors, but can be matched for more than 500 custom shades. Consum- ers is uniquely situated and equipped to offer an evolving concrete masonry unit inventory; its location at the heart of the Great Lakes enables economical delivery and stocking of premium aggregates from a wide swath of U.S. and Canadian reserves. The Wyoming plant alone has more than 15 aggregates on hand, and counts among recent spe- cial orders block bearing obsidian fine aggregate—the black granite sourced from an Ontario deposit so far north that spring 2018 deliv- eries were delayed due to an extended seasonal freeze. 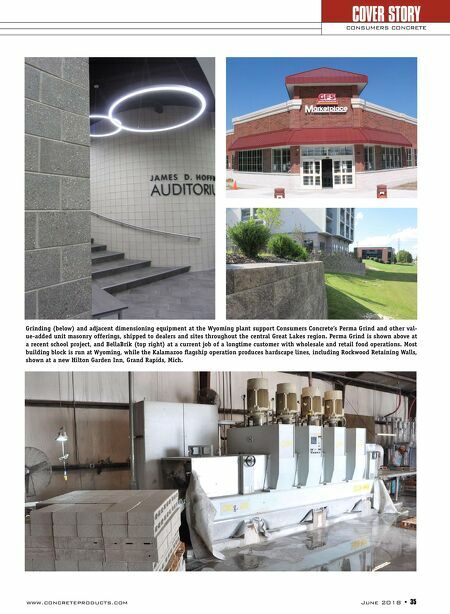 Colored mix production capabilities across the 24 concrete masonry and ready mixed plants enable Consumers to match flatwork, building or hardscape block, precast retaining wall, and mortar as projects warrant. Marketing Manager Thomas Richeal credits the enhanced focus on the One Consumers initiative with more opportunities for cross-selling manufactured products and ready mixed concrete. As Richeal and his colleagues note, Consumers is positioned for success as they look beyond the pre-recession Michigan market and recognize the truly different times ahead. "The rules for success and customer engagement have changed. That's the reality of the con- struction world," he affirms. "But when customers need something right, whether it's a typical or atypical product, Consumers Concrete is still the one they count on and trust."